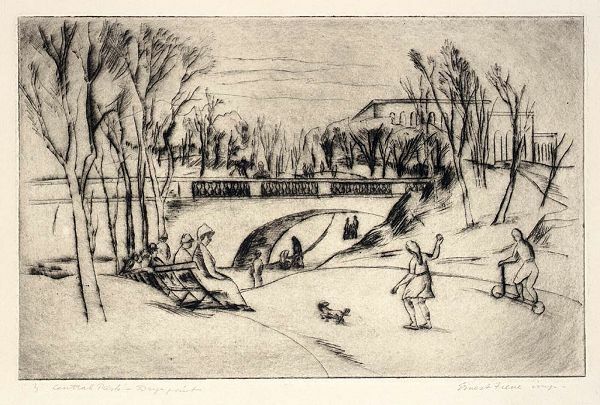 Ernest Fiene drypoint "Central Park"
Currently Entries #2-13 are empty in order to leave spaces for currently undiscovered or unverified prints. For an enlargment, please click the image. Please note: All other photos of Central Park appearing in this catalogue raisonné and on this website are courtesy of the Smithsonian American Art Museum. Dimensions: 6 15/16 x 10 7/8 in. **Edition: Currently the only observed impression of "Central Park," on which no edition is indicated, is the one in the collection of the Smithsonian American Art Museum (SAAM) . *** Printer and Annotations: The SAAM impression is signed (l.l.) "Ernest Fiene imp -" where "imp" is the abbreviation for the Latin word "impressit" meaning, "he/she printed it." Following the artist's signature, this abbreviation signifies the work was printed by the artist. 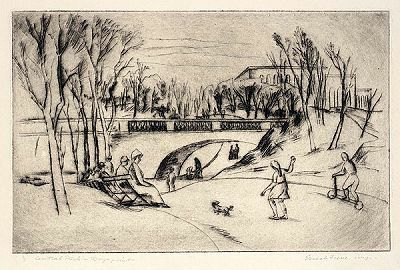 The SAAM impression is annotated "3 Central Park - Dry point" (l.r.) See below. This annotation pattern does not conform to the typical pattern seen in most of Fiene's later prints, reinforcing the early dating estimated above.